We would have never been able to position ourselves as a leading manufacturer and exporter of Organic Liquid Fertilizers, if we wouldn’t have focused on quality. As a matter of fact, our agro products are completely biodegradable and this is what makes these highly sought after. We are looking for Export Inquiries from UAE, Africa, Russia, Egypt, Turkey, Sri Lanka, Iran and Vietnam. Organic Potash is a bio available source of potash manufactured with the help of micro nutrients through fermentation process, absorbed and assimilated into the plant system, thus are very beneficial for the crops. Dosage: 500ml / Acre. Recommended to mix 2 -3 ml of Ecogold Glacpot liquid per liter of water and spray in three different stages of crop growth. Vegetative Flowering & post flowering stages. The above said quantity can be applied through fertigation / drip irrigation also. Packaging Details: ONE LITER X 10 BOTTLES IN A CORRUGATED CARTON, AND 1360 CARTONS IN A 20'FT CONTAINER. 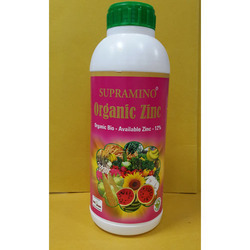 We offer Sliming Organic Zincfor a wide range of customers. Supramino organic zinc is a bio available source of zinc, manufactured with the help of micro organisms through fermentation process. As it is enriched with gluconates -lactates, nutrients are easily absorbed and assimilated into the plant system, thus are very beneficial for crops. Ecogold orzinc is in liquid form & is highly water facilitates complete absorption by the crops. Dosage: 500ml per Acre . Recommended to mix 2-3 ml of ecogold organic liquid per liter of water and spray in three different stages of crop growth, vegetative, flowering and fruiting stages. The above said quantity can be applied through fertigation / drip irrigation also. Capitalizing on our in-depth industry knowledge, we are engaged in designing and supplying high quality range of Organic Phosphorus. Organic Bio available Phosphorus is used to cure/ treat and prevent phosphorus deficiency for various crops like plantation, field crops, vegetables, fruits cereals, sugarcane and all other commercial crops like cotton, soya, chili and other horticulture crops. Dosage: 500ML per Acre. Recommended to mix 2-3 ml of SUPRAMINO ORGANIC PHOSPHORUS liquid per litre of water and spray in two different stages of crop growth during vegetative & flowering stages. The above said quantity can be applied through fertigation / drip irrigation also. Organic Calmag is a complete nutritional product, which contains organic Calcium, Magnesium, Potassium, Zinc, Manganese, Ferrous, Copper, Boron and all other micro nutrients. Organic Calmag is easily and readily absorbable by all crops and enhances the size, weight , color of fruit and ensures higher yields & best quality. These nutrients are made available in the form of Gluconates, Lactates, which are manufactured with the help of micro organisms through fermentation process. 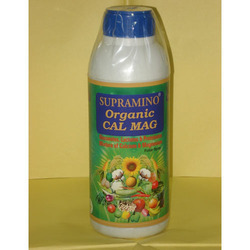 Supramino Organic Calmag is an ideal Nutritional product based on sophisticated Biotechnology fermentation process & 100% Biodegradable; it is Toxin free and residue free. Presence of Boron in Organic form ensures prevention of flower drop and enhances fruits set. Completely organic product & effective to replace synthetic & imported products. Enhances flowering, fruit set & ensures higher yields. Prevents & corrects nutrient deficiency. Enhances number of fruits, fruit size & quality of the fruit. Dosage: 500ml / acre. 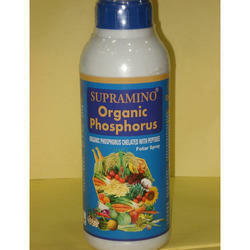 Recommend to mix 3-4 ml of SUPRAMINO ORGANIC CALMAG per liter of water and spray on crop / plants. First spray during vegetative stage & second spray during pre - flowering stage and third spray during fruit setting stage is recommended for better growth and yields. Supramino Organic Calmag is a compatible to almost all type of chemical pesticides, fertilizers, bio fertilizers/ bio pesticides and can be mixed together while spraying. It can be sprayed simultaneously, thereby minimizing cost of application. • Fine, free-flowing, powdery form facilitates handling and ensures easy and quick dispersion of micro nutrients. • Higher content of easily digestible phosphorous and calcium. • Our automated processing minimizes impurities. • Customer support for companies, farmers and end users. We exercise stringent quality control not only in the selection of raw material, but also at every stage of production, until the product is finally delivered into the hands of our customer.